Are you a rescuer? Read about a riptide rescue to learn from ants. Roberta was sitting in her beach chair in Florida when she realized her two children were missing. She looked out and saw them caught in the rip tide. Instincts kicked in and she ran into the water to save them. Eventually, ten people had gone in to try to save the children They were all caught in the riptide; all in danger of drowning. What happened next is a lesson from ants. A bystander remembered something he’d seen on television that some ants link their bodies into bridges so they can cross water. He started yelling, “Grab arms,” and he and about five other people held hands to make a human chain. 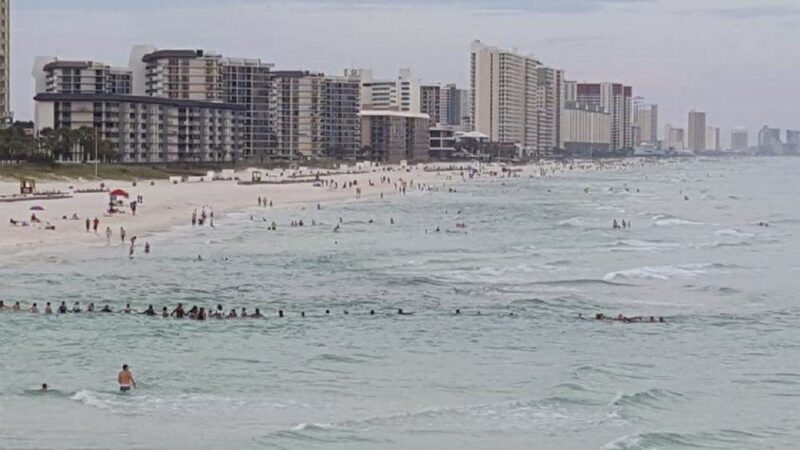 Eventually, 70 people linked arms to rescue the ten in the rip current. One person broke from the chain to pass a boogie board to the ten who were clearly in danger of drowning. Then through determination, the chain of people started pulling each drowning person back to shore. Ten people were rescued by 70 strangers who locked arms. A lesson from ants. This story is from Kind World, a podcast from WBUR in Boston: “stories about the profound effect one act can have on our lives”. As I listened to this broadcast, I wondered about all the opportunities where we could be locking arms together to support each other. I’m not sure ants really do lock together to cross water but the image of 70 people locking arms in a riptide to rescue 10 people is really quite remarkable. In our families, communities and workplaces there are often individuals who rush in to rescue others. They have the answers, give advice and try to make things better. In this scenario, the line of people rescued. They co-created a solution and found the best way to get ten drowning people out of the water. Are you a rescuer? Do you rush in to save those in need? If so, perhaps you need stop, think ANTS, and lock arm with others. Instead of being the rescuer, try finding some people to lock arms with to co-create a better solution. Leaders often find themselves in the rescuer role. Next time you feel the pull to rescue, push the pause button and find a group of people to create a solution. More than likely by combining your collective strengths the solution will be smarter, stronger, and more resilient. If you want to learn more about the rescuer role, read David Emerald’s description on the Rescuer.